Advanced spam blocking software is becoming a necessity due to the increasingly sophisticated techniques being used by spammers to avoid detection. Whereas once, spam emails were fairly easy to detect due to a number of tell-tale signs, most standard software to block spam email fails to keep pace with the latest techniques being used by cybercriminals to spread malware and ransomware. Research shows that an increasing volume of spam email is avoiding detection and it only takes one click on a malicious link or the opening of an attachment harboring malware in order to infect a whole network. For this reason, security-conscious businesses are investing in advanced spam blocking software in order to better protect their networks from email-borne threats. In order to best explain the advantages of advanced spam blocking software, it helps to understand how standard software to block spam email works. Standard software usually consists of front end test such a Real Time Blacklists and SURBL filter to block emails from known sources of spam. More recent software also has recipient verification mechanisms to block spam sent to non-existent email addresses. Standard software to block spam email detects around 95% – 99% of spam email. This means an employee will receive on average 8-12 spam emails per day – such is the volume of spam being sent. It does not take long for a security-conscious employee to flag a suspicious email, but should a less security-conscious employee click on a malicious link, the consequences could be very serious. By comparison, advanced spam blocking software includes a process known as greylisting. In this process, every email is returned to its originating server with a request for the email to be resent. Usually the request is fulfilled within five minutes, but spammers´ servers are too busy sending out fresh spam to respond to the request, and the spam email is never returned. By using this process, advanced spam blocking software detects spam from previously unknown sources of spam. In tests an email spam blocker with greylisting is capable of blocking 99.97% of spam emails – subject to its parameter´s settings – resulting in employees receiving an average of 2-4 spam emails a day. It is not perfect, but it decreases a business´s exposure to risk by up to 67%. Advanced spam blocking software does not only block spam email coming into a business´s network, but also outbound spam email as well. There are two reasons for this. The first is to prevent any undetected malware in the network being shared with the business´s contacts. This could happen, for example, if an employee has attached his or her malware-infected mobile device to the business´s wireless network. The second purpose of outbound mail scanning is to identify if a spammer has been able to compromise a corporate email account and use it to send spam from a “trusted source”. Many business´s whitelist trusted sources to avoid a delay in receiving emails during the greylisting process. Spammers often use phishing techniques to take control of corporate email accounts for this purpose – a scenario that can be avoided with advanced spam blocking software. If you feel your business is receiving too much spam email, and you are concerned at the risks this presents, you are invited to try our advanced email spam blocker for free. Our email spam blocker has all the advanced features businesses need to better protect their networks from phishing, malware and ransomware, and they also help improve employee productivity as spam email decreases. To find out more about our free trial of SpamTitan, do not hesitate to contact us. Our team of Sales Engineers will discuss your requirements with you in order to provide the most appropriate deployment option for your trial (on-premises spam blocking software or cloud-based software to block spam email) and explain how the software is managed from its centralized administration portal. 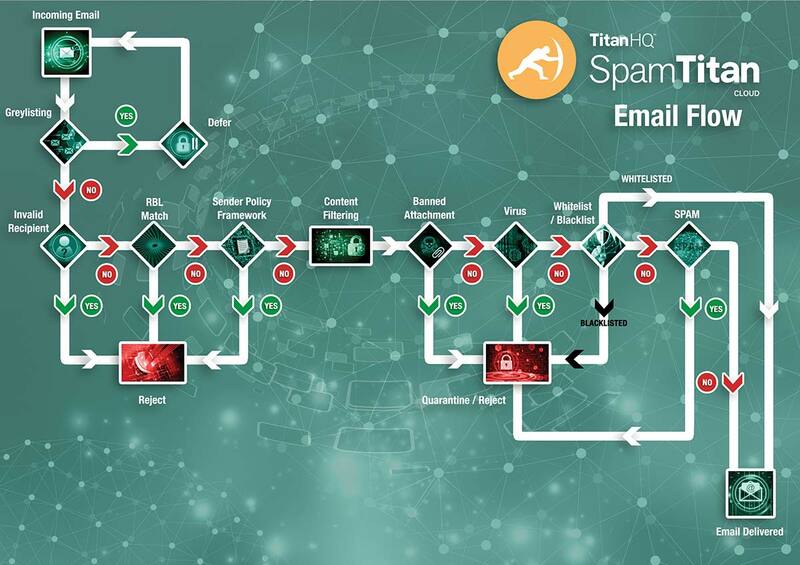 The free trial gives you the opportunity to evaluate SpamTitan in your own environment and to find the optimum spam acceptance thresholds for your business´s requirements. Should you decide to continue using SpamTitan at the end of the trial, not only will we offer you a competitive range of subscription options, but no further configuration of our spam blocking software will be necessary. Contact us today to find out more.